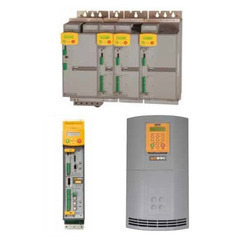 Parker offers a complete range of AC variable speed drives for a wide variety of applications ranging from 0.2 to 2000 kW. Parker drive solutions range from basic motor control to advanced, closed-loop process line applications. he AC30 variable speed drive range has been designed to provide users with exceptional levels of control, from simple open-loop pumps and fans through to closed-loop process line applications. Its flexible and highly modular construction enables a wide range of communications and I/O modules to be easily added as required. The AC30 has been designed with simplicity in mind, but this doesn't compromise its functionality. Integrated macros for a range of applications and PLC functionality enable more capable users to create sophisticated control that would previously have required a separate PLC. Designed for operation in environment class 3C3 and 3C4 for Hydrogen Sulphide (H2S) as standard (tested at 25 ppm for 1200 hours), temperatures up to 50 °C with optional integrated EMC filter to C2 1st environment and DC link choke to reduce line harmonics. AC30 also complies with RoHS substance restrictions in accordance with EC Directive 2011/65/EU. Note: AC30 power stacks and interchangeable control modules are available as separate componenets, offering advanced levels of automation control and greater design flexibility - see the "AC30 Series [Power Modules]" and "AC30 Series [Control Modules]" pages in the recommended products section for more details. • Automatic belt breakage detection : Interactive monitoring of the running conditions of a fan allows AC30 to detect a breakage in the drive belt between the fan and motor, stop the motor and indicate an alarm condition. • Catching a spinning load - "fly-catching" : The fan control algorithms enable the AC30 to detect when a fan is free-wheeling and to regain control of it before running it at the commanded speed. • PID Control : Multiple PID control loops can be programmed to monitor process variables and adjust the speed of the motor accordingly to achieve the required variable setpoint. - Simplicity : AC10 drives are designed to reduce the time and effort required to install, setup and commission through its easy to use integrated keypad. Minimal wiring requirements and two easily accessed terminal rails make AC10 fast and simple to install, having you up and running in no time at all. Auto-tuning sensorless vector mode takes AC10 beyond simple V/Hz control, allowing users requiring greater dynamic speed or torque control for their application to benefit from the drives enhanced 0.5% speed and 5% torque accuracy. - Reliability : Proven technology and manufacturing techniques ensure AC10 drives have been engineered and built to deliver consistently outstanding levels of performance day in, day out, ensuring maximum uptime and productivity. Thanks to its conformally coated PCBs, AC10 drives are able to withstand even the most arduous class 3C3 environment which many other AC drives in this class would struggle with, allowing you to operate the AC10 with the utmost confidence in more applications. - IP20 (0.2 - 180kW) or IP66 (0.4 - 90kW) : The IP66 enclosure enables use in both indoor and outdoor applications where environmental conditions may be a concern, such as wash-down areas in food and beverage facilities and use in waste plants or rooftop units. 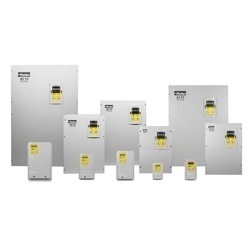 The AC690+ Integrator Series is a single range of AC drives designed to meet the requirements of all variable speed applications from simple single motor speed control through to the most sophisticated integrated multi-drive systems. The heart of the AC690+ is a highly advanced 32-bit microprocessor based motor control model. This provides an exceptional dynamic performance platform to which can be added a host of communications and control options, enabling you to tailor the drives to meet your exact requirements. The AC690+ is available in 380-460V 3-phase 1 to 1500 HP and 220V-240V 1 to 75 HP. This mode is ideal for basic motor speed control, or multiple motors driven in parallel. The quick set-up menu and plain language display ensures the quickest and easiest, trouble free start up. High starting torque and tight speed regulation is provided by a sophisticated MRAS (Model Reference Adaptive System) motor control strategy. MRAS provides accurate speed simulation (without the need for any speed measuring transducer) by continually modeling the motor. Full closed-loop flux vector performance can be achieved with the AC690+ by simply adding an encoder feedback 'technology box'. This provides 100% continuous full load standstill torque plus a highly dynamic speed loop (up to 45 Hz bandwidth) ; more than sufficient for the most demanding of applications. Frame B = 3, 6 or 9kHz / Frame C, D, E and F = 3 or 6kHz - All with audibly silent switching frequency. The AC890 are a compact, modular system variable speed AC drive engineered to control speed and position of open-loop and closed-loop, single- or multi-motor AC induction or servo motor applications. Compatible with a wide range of feedback options, the AC890 variable speed drive is compatible with any AC motor and virtually any speed/position feedback options. With this flexibility you may not even need to replace your existing AC motor to achieve high performance, saving you time and money. The AC890 drives are available in 380-460/500V 3-phase 0.55 to 1200kW and 220V-240V 3-phase 0.55 to 7.5kW. This mode is ideal for basic, single or multi-motor speed control. With its ultra high performance sensorless vector algorithm, the AC890 delivers a combination of both high torque and close speed regulation without the need for any speed measuring transducer. Full closed-loop flux vector performance can be achieved with the AC890 by simply adding an encoder feedback 'technology box'. This provides 100% continuous full load standstill torque, plus a highly dynamic speed loop more than sufficient for the most demanding applications. With this configuration, the energy is fed back into the mains supply with sinusoidal currents and unity power factor; a very low current harmonic content is achieved (THD < 5%). Taking advantage of leading edge control algorithms running on a fast 150Mhz microprocessor, the AC890 drive can achieve very high-bandwidth control loops. This allows you to use the drive for the most demanding industrial applications e.g. printing, cut-tolength, rotary shear, converting and slitting. Designed to integrate in existing automation systems, the AC890 features high performance ports linked directly to the fast control loops of the drive. Minimum delay exists between your digital setpoint sent through a fieldbus and the control loops. Your existing analogue setpoint-based solutions can be replaced by a digital fieldbus-based solution with minimal bandwidth loss. The AC890 offers system designers complete flexibility in their choice of feedback technology. The AC890 has been deliberately designed to integrate seamlessly into your automation network. To connect to your PLC or fieldbus network you can simply choose from the wide range of communication technology boxes. Motion control with added position loop, motion control function blocks, move incremental, move absolute, move home, line drive master ramp and section control, winder blocks (speed winder, current winder), full function PID, machine state and others. All advanced features plus : library of pre-engineered application specific LINK VM function blocks such as : shaftless printing, cut-to-length, adanced winding, advanced traversing and others. 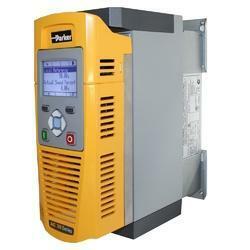 Looking for PARKER MAKE AC DRIVES ?